Erin Gilbert's co-author and fellow believer, Yates suggests they use their knowledge of the supernatural to deal with a major ghost problem in New York City. If nothing else, the Ghostbusters reboot would have been interesting purely because it was a Melissa McCarthy movie whose premise wasn't "boy, Melissa McCarthy sure is large and awkward, isn't she?" Instead, it turned out to be completely creative and funny, a worthy success to the franchise. Since the Minimates have removable proton packs, the details of their jumpsuits are simply painted on: the reflective stripes, the pockets, all the wrinkles (different on all four figures) and even their tiny nametags. That's good tampographing! Abby's got a big smile on her face and is wearing her glasses, and her hair is a new piece with a messy bun on top. She also includes the new film's version of the PKE meter, which (since it's in its closed form rather than open) just ends up looking like a strange knife. 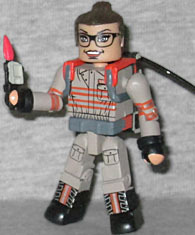 And while the proton packs have pegs on the side that allow you to stow the gun, the one on my Minimate's is missing. Fortunately, since they're all the same, I may trade it to someone else, so her hands can stay free for the PKE. After an encounter with the supernatural, municipal employee Patty Tolan's knowledge of New York City makes her a valuable addition to the Ghostbusters team. Boy oh boy, did people complain about Leslie Jones in the movie! I mean, the MRAs were crying about it from the start, but making the sole black member of the group also the only one who wasn't a scientist let the concern trolls pretend they had non-gender-based issues with the movie. The key word there being "pretend." Even as a civilian, Patty Tolan was a fun addition to the movie, because Leslie Jones is awesome. 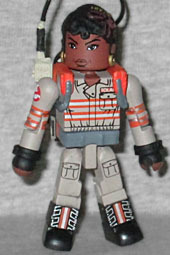 It's a bit disappointing that all four Ghostbusters just use the same standard Minimate body, since the women are different sizes (Abby could have a chest cap and Patty could use a waist extender, for example), but she does at least get new hair, with her braids and her big earrings.